In a recent post about STEM education and career preparation, I searched online to find jobs related to science, technology, engineering, and math. In the search box of popular job site listings such as Indeed or Monster.com, previously I had put job titles. Instead, this time I entered the keywords Microsoft Office. 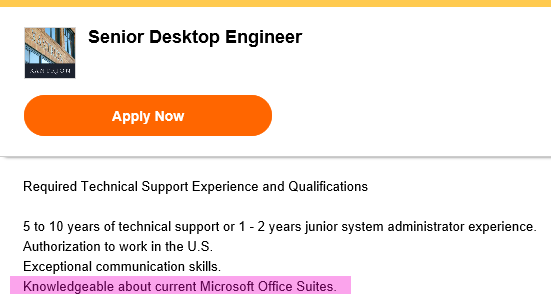 I was shocked to see the number of jobs in which Microsoft Office proficiency was listed in the Skills/Knowledge or Key Competencies requirements. What does this mean for the students of today? As teachers, one of our main areas of focus is career preparation. It’s apparent that employers value technology skills in addition to the qualifications related to the specific job. Regardless of the career, whether it is as an environmental scientist, software developer, civil engineer, financial analyst, or any of the countless possibilities for the future, a foundation in the basic Microsoft Office programs is a benefit. A well-rounded proficiency in general word processing, spreadsheet, presentation, database, and desktop publishing skills is often expected. Once students acquire a balanced foundation, they are well prepared to branch out and learn more complex, job-specific software. STEM education advocates a blending of disciplines. Also, students should be given meaningful, real-world tasks. A typical challenge may require resources from a variety of curricular areas. Technology tools should be used as they are needed. To pick an application to complete a task, students need a well-balanced background in a suite of programs. Once they have a sound understanding of Microsoft Office, students can tackle an inquiry project and make an informed decision about which apps they need to use. If they need to write a report, they should already know how to use the main tools of Word. If they want to create a graph, a fundamental understanding of Excel is needed. If project results should be displayed as a visual presentation, previous experience with PowerPoint is indispensable. The skills to use the right tools empower students to solve problems effectively. As students build Microsoft Office proficiency, the confidence they gain inspires them to confront new challenges and further inquiry. Their critical thinking skills, flexibility, and troubleshooting expertise help them to adapt to other computer applications that they may encounter in upcoming years at school or in the workplace. As teachers, one of our essential goals is to equip students with technology and professional skills while offering an interdisciplinary curriculum in order to prepare students for the workplace of the future. This task can seem formidable for sure! Project based learning can achieve all of these goals. TechnoKids technology projects are integrated activities that pose real-world problems. Students complete assignments such as publishing a newsletter, launching a new business venture, preparing a budget, collaborating to debate a controversial issue, or promoting a weekend getaway. As students solve these challenges, they learn the key computer skills that they need. 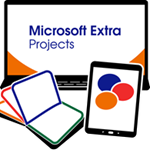 TechnoKids Microsoft Extra Package is a collection of ICT and STEM technology projects for Microsoft Word, Excel, PowerPoint, and more. Using a project-based framework, students build fundamental skills in word processing, spreadsheets, presentation, desktop publishing, and databases. In addition, the technology skills are blended with professional skills such as time management, communication, and teamwork. These are all critical elements for career readiness. Presented in a real-world, meaningful setting, each TechnoKids project engages students, fosters computer literacy, and inspires innovative thinking. By developing a sound basis in Microsoft Office today, students can be better prepared for STEM job opportunities in the workplace of the future.